Founded in 1993, Bradel Properties Ltd has grown to become a respected landlord in London and Timmins. The founding philosophies of providing affordable, high-quality housing and excellent customer service are still intact today. Since its founding Bradel Properties now has grown to include 4 residential sites and 2 commercial locations between London and Timmins. We proudly serve a broad range of tenants with varying housing and business needs. Bradel Properties is a progressive management company and recognizes the worth of providing quality residential and commercial opportunities to the community. With an in-house maintenance team, friendly, professional office staff, on-site superintendents and cleaning staff; Bradel Properties strives to provide a comfortable and enjoyable experience during your tenancy with us. 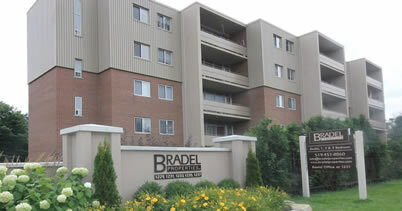 Bradel Properties provide residents with 24-hour on-site management to ensure all urgent needs are attended to. Our entire staff is professionally trained and friendly and devoted to creating an environment that is clean, safe, and secure.